Recuperating pelicans in Northern California now have a better place to stretch their wings after the construction of a new 100-foot flight aviary at International Bird Rescue’s San Francisco Bay Center located in Fairfield. In 2007, thanks to a generous grant from the Green Foundation and funding from the California Department of Fish and Game, IBRRC designed and built the aviary at the San Francisco Bay Oiled Wildlife Care & Education Center. 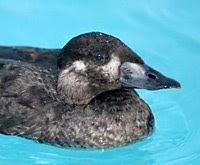 The center is managed by IBRRC as part of Oiled Wildlife Care Network (OWCN) treating oiled, injured and sick aquatic birds year-round in the Northern California area and beyond. The critical need for an extra large aviary to care for pelicans and other large birds has always been known. It became even more evident in 2002 when IBRRC treated over 200 sick brown pelicans. 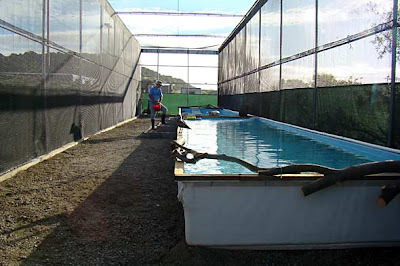 This is IBRRC’s second aviary on the west coast. In 2001, the first large pelican aviary was built and operates at the Los Angeles Oiled Wildlife Care & Education Center in San Pedro, CA. In seven years it has housed over a 1,000 Brown and White Pelicans and many other sea bird species including Cormorants, Terns, Gulls, Frigatebirds, Albatross and Boobies. A high number of inspected cargo ships entering California ports are failing routine emergency oil spill drills, according to state inspectors. In public records obtained by The Sacramento Bee newspaper, 21 of 164 vessel given spot inspections by state officials over the past three years were lacking the ability to make phone notifications within the 30-minute time frame set down by a state law covering maritime oil spill procedures. Often the ship’s crew failed to locate the phone numbers or didn’t understand the task. The Bee’s story comes on the heals of the Cosco Busan oil spill in which he container ship struck the Bay Bridge, spilling 53,000 gallons of fuel oil into San Francisco Bay. The ship’s crew failed to make the vital phone calls in time, among the reasons the spill grew so large. Also included in the paper’s report is an illuminating time line from the first 90 minutes of the Cosco Busan spill. The November 7, 2007 fuel oil spill killed more than 2,500 migratory birds. John Cota, the pilot entrusted with navigating the container ship that struck the San Francisco Bay Bridge, pleaded not guilty Friday to charges of criminal negligence and violating environmental laws. The 901-foot Cosco Busan ship side-swipped the bridge in November 2007 and spilled more than 50,000 gallons of bunker fuel into the bay. The corresponding spill left thousands of migratory birds coated with the gooey oil. At least 2,500 aquatic birds died in the spill and scientists speculate that thousands more succumbed and were never recovered. The pilot boat captain responsible for helping navigate the container ship Cosco Busan that struck the San Francisco Bay Bridge and spilling thousands of gallons of oil that ultimately killed 2,500 birds, has been charged in federal court. On Monday, Capt. John J. Cota of Petaluma was charged with two environmental laws, including violating the Clean Water Act through criminal negligence and of killing birds, a violation of the Migratory Bird Treaty Act. 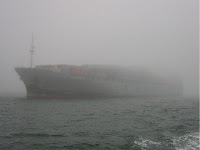 The 60 year-old Cota was in charge of navigating the 901-foot container ship out of San Francisco Bay on the morning of November 7, 2007 when it ran into the Bay Bridge in heavy fog. More than 50,000 gallons of bunker crude oil spewed out of the side of the ship. The oil spill closed beaches, coated birds with toxic crude and left a swath of oil from Oakland estuaries to Richardson Bay to outside the Golden Gate Bridge. In the meantime, Cota had his pilot’s license suspended by a state pilot commission after it concluded that “pilot error” was the cause of the crash. The National Transportation Safety Board (NTSB) will hold a two-day public hearing Cosco Busan oil spill that dumped around 55,000 gallons of fuel oil into San Francisco Bay after striking the San Francisco-Oakland Bay Bridge. The hearing will be held at 8:30 a.m. on Tuesday, April 8 at the NTSB’s Board Room and Conference Center, 429 L’Enfant Plaza, SW., Washington, D.C. The hearing is part of the NTSB’s ongoing investigation into the accident that involved the 900-foot Cosco Busan container ship that struck the San Francisco-Oakland Bay Bridge on November 7, 2007. The board hopes to learn more about why Coast Guard and state officials were so slow to react and report the spill that killed more than 2,500 birds. The hearing will be webcast. An agenda and webcast details will be posted on the Board’s website, http://www.ntsb.gov, when available. Do you have an old car that you’d like put to good use? Then please donate it to IBRRC. We just linked up again with a car donation program that will take your car, sell it auction and donate the proceeds to our general operating fund. And you get a tax write-off for your good deed. To learn more, please visit our Car Donation page on the IBRRC website. In our proud 37 year history of working with oiled, sick and injured birds, IBRRC has treated more than 100,000 birds. This includes oil spills and general rehabilitation treatment.